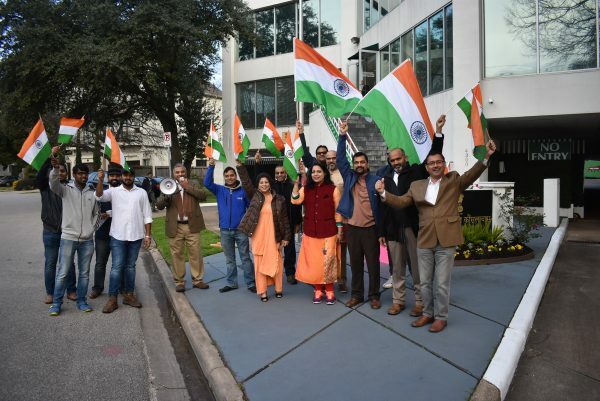 Members of the informal Friends of India group gave rousing patriotic chants outside the Indian Consulate on Scotland Street. HOUSTON: For pomp and pageantry that highlights the diverse cultures of India and its military might, nothing compares to the massive parade that makes its way down Rajpath to India Gate in New Delhi on Republic Day. And as the address from Indian President Ram Nath Kovind was read out this past Saturday, it evoked past memories of many such mornings spent shivering in the New Delhi early morning chill standing on the bleachers that lined the broad avenue, intently taking in the patriotic sentiments in the message and waiting impatiently for the parade to begin. The festivities conclude in the evening with a Beating the Retreat program featuring soldiers on horseback. This past Saturday morning, January 26, at 7:30, in the chill on the rear balcony of the Indian Consulate on Scotland Street off Memorial Drive, the Consul General Anupam Ray unfurled the Indian tricolors as the people assembled below listened to the Indian national anthem sung by Rajarajeshwary Bhat and disciples. They made their way up the staircase to the large hall, which has become a place of many gatherings ever since Ray conceived use of the vacant space, and sat in rows or stood in the back, perhaps 150 people who made the effort to rise early on a Saturday morning for the event. Guests of honor included Congressman Pete Olson, who narrowly won re-election this past November and gave best wishes for the celebration. The other guest was newly elected Fort Bend County Judge K.P. George, the first Indian-American or Asian to hold that position, who presented Ray which an award for his dedicated support of the Indian community. Light refreshments were served later in the Consular Hall. Even as the activities were going on inside, a die-hard group of locals called the Friends of India, stood outside on the street side from early morning, chanting patriotic slogans with a megaphone and waving Indian flags, both large and small, at people and cars going by.